I love to bake. Breads, brownies, muffins, cakes and cookies are all fair game. Even the occaisional pie makes its way into my oven. Because the urge to bake can hit at any moment, there are some things I make sure to always have in the house. There's always at least one unopened bag of sugar so I can be sure I'll never run out. I buy the biggest bag of flour I can. Chocolate chips and vanilla are always in the cupboard and I make sure to keep baking soda, baking powder and brown sugar stocked. There's nothing worse than starting to bake something, only to realize I don't have enough of an ingredient. Likewise, I love to be able to sew something from my stash, even if it's something I don't usually sew, like the tag blankets and fidget blankets I've made recently. That's why I keep random bits of ribbons, old buttons and other bits and pieces. You never know what will come in handy for some new project. Whether baking or sewing, it feels good to be ready for whatever I want to make. Isn't it interesting that even the Bible talks about being ready? "If someone asks about your hope as a believer, always be ready to explain it. But do this in a gentle and respectful way" (1 Peter 3:15, 16). First of all, I love that Peter assumes people will be curious about this hope we have. That means he's also assuming that we will seem different enough from other people that they will notice we have something they don't. Then, when they do notice that we're a bit different, we should be ready to explain why. That means we should be able to explain what we believe. I believe that God loves His people. I believe that Jesus really lived, that He died on a cross to take away my sins and that He rose again. I believe that because of His death and resurrection, I have the hope of spending eternity with God in heaven. Sometimes, there will be more questions. Maybe people will ask why we believe. Maybe they'll ask if even their sins could be taken away. Or maybe they'll ask if God could still love them even after what they've done. Or they might ask why God allowed some awful thing to happen. Whatever the questions, we should be ready to answer. Sometimes, unfortunately, the answer will simply be "I don't know," because sometimes we just can't know why things happen. 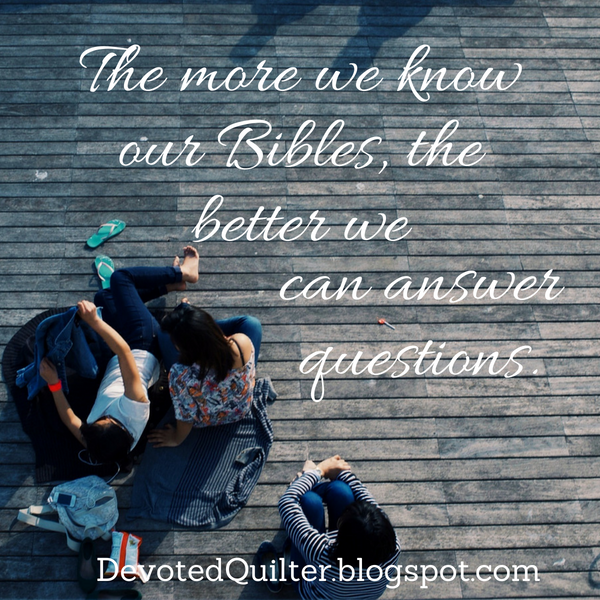 But the more we know our Bibles, the more ready we'll be and the more questions we'll be able to answer. It's not that we have to be experts or have advanced degrees in theology or anything. But if people are genuinely curious, wouldn't it be wonderful to be able to answer their questions and maybe help them understand how much God loves them? Great message. Definitely can be applied to many aspects of life. Thanks for the reminder.